The Ecobee3 was already our favorite smart thermostat, edging out the Nest Learning Thermostat thanks to its remote sensors and overall functionality, but we weren’t sure what to expect from the follow-up. Apparently, the answer is Alexa. The Ecobee4 plays it safe when it comes to evolving the winning thermostat line. So safe, in fact, that there’s only one major difference between the 3 and 4: the integration of Amazon’s Alexa smart assistant. 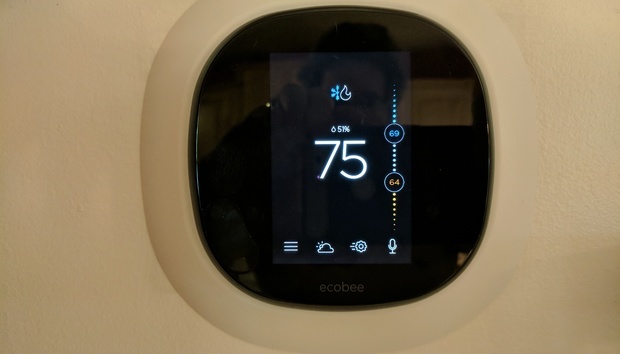 If you were thinking of upgrading your home to an Ecobee, but waiting on the latest, that purchase decision relies entirely on your interest in being able to talk directly to your thermostat. While the 4 looks almost identical to the 3, if slightly larger, it’s now packed with a speaker and microphone to accommodate its new role as a smart hub that can tell you jokes and the weather, change the temperature in the house, and, if you really want, play music from Amazon’s music service (among many other tasks). The new speaker and microphones are the big new addition to the physical design. I’m honestly not sure I see the point, but there might be some who consider this pairing one of logical convenience. 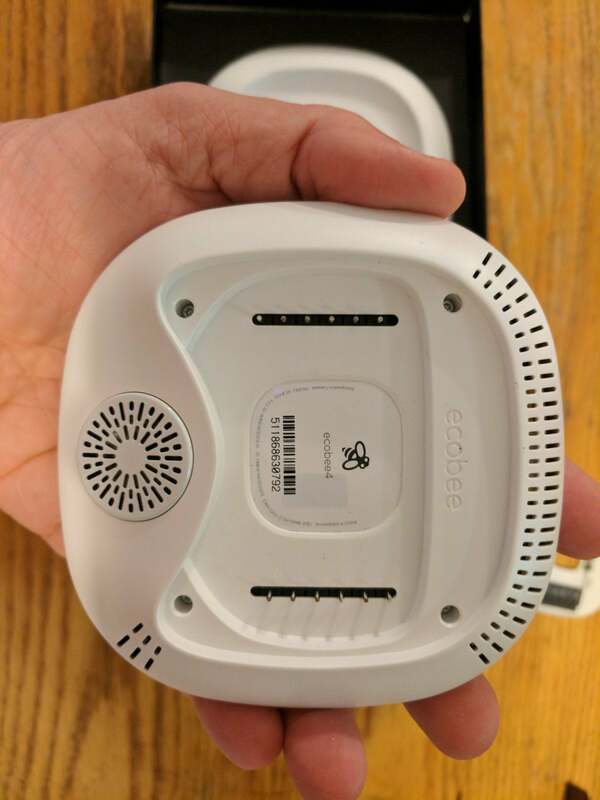 If your thermostat is in a central place in the house (say a kitchen or living room) and you don’t already own any sort of Amazon Alexa hub, the Ecobee4’s ability to be a smart hub could make sense. If it doesn’t make sense, the Alexa service (which defaults as active) can be turned off at any time by tapping on the microphone icon on the unit’s main screen. If you’ve installed a thermostat before, there’s nothing out of the ordinary here. I did, however, find it a little annoying that when the function is off, the Ecobee lets you know via a bright red light band at the top of the unit that stays on until you turn the mic back on. Admittedly, the actual Amazon Echo does the same thing. I also wouldn’t recommend using the Ecobee4 for playing music unless you’re really desperate for background noise. While it’s not the worst speaker I’ve ever heard, the actual Amazon Echo’s speaker is at least a little better. Aside from Alexa, the Ecobee4 is basically identical to the Ecobee3. It comes with one remote sensor just as before, uses the same app, functions identically, and uses basically the same touchscreen interface. It’s sharp, easy to use, and has excellent weather reporting. The main app interface. Easy to use and minimal design. The Ecobee is all about its remote sensor, which is the main reason why we like it so much. Far more complex than a mere remote thermometer, you can configure how you interact with your HVAC system with these sensors. For many, the actual thermostat is tucked away from the main parts of the house, so being able to put these tiny sensors in the rooms that really matter for comfort is a big deal. 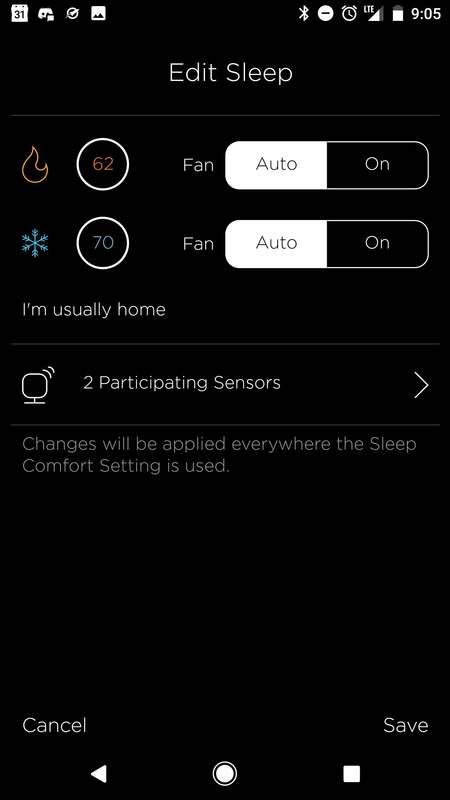 Ecobee allows you to dictate things like if you just want the unit to average the temperature readings of the main unit and the sensors together or actually focus on the remote sensor(s). 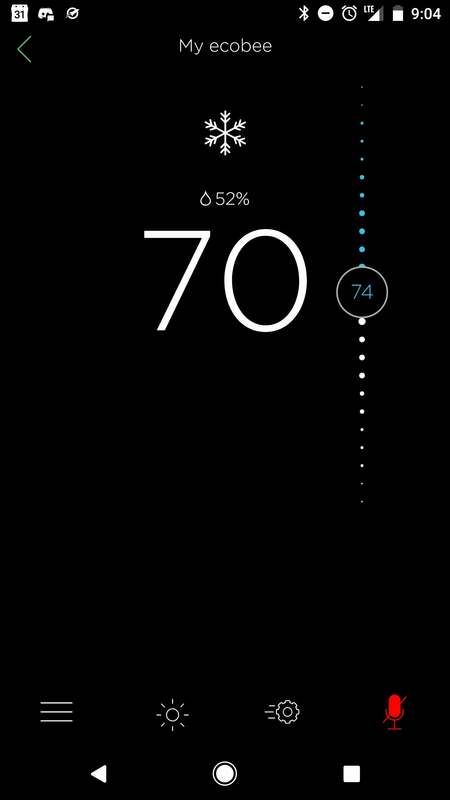 So, if you work from home and have the sensor in your home office, the Ecobee can adjust the temperature based purely on the readings in your office. It’s a terrific, completely logical feature we’re still shocked other manufacturers haven’t blatantly stolen. Beyond that, the Ecobee offers home/away settings that use the motion sensors in both the main unit and remote sensors to know when someone is in a room and adjust accordingly. Setting up the Ecobee is a simple affair, as well. It asks you a few questions about your ideal temperatures and that’s basically it. For those who like heavy-duty, down-in-the-weeds scheduling, however, the software does come up short. The Ecobee scheduling is really only interested in three time zones: sleep, home, and away. You can’t create a complicated schedule of adjustments throughout the day like many admittedly less-smart thermostats allow, since the Ecobee adjusts based on your set temperature preferences for cooling and heating, and data from the motion sensors. Ideally, you shouldn’t ever need to either. Heating and cooling are easy to configure. 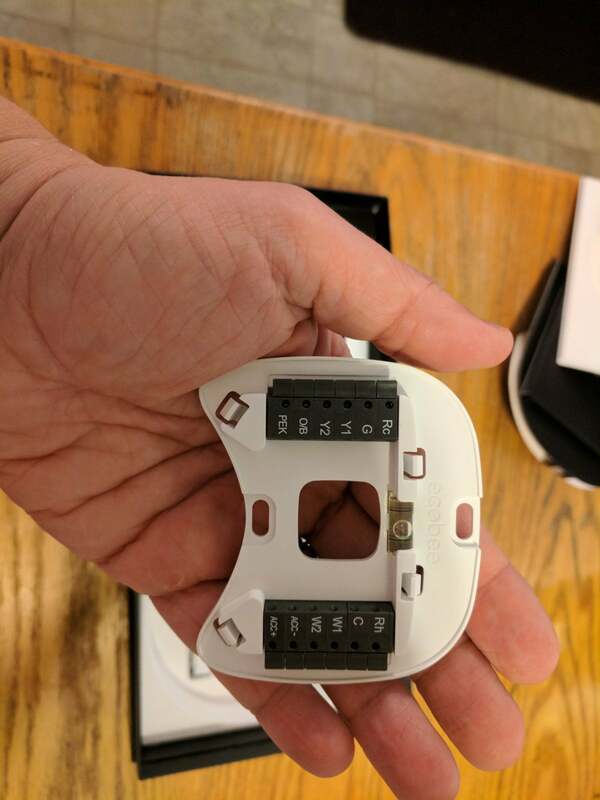 Another concern is that while you don’t absolutely need a C wire to install it, the Ecobee comes with a wiring adapter (they call it a “power extender kit”) to get power to the unit, which can add some complication to the overall installation. Thankfully, the app and site provide excellent directions. Being a high-end thermostat, the Ecobee4 supports a wide range of systems and devices, including humidifiers, dehumidifiers, or ventilators. The Ecobee4 is just as recommendable as the 3, but there’s little reason for current Ecobee owners to upgrade to this new iteration. Adding Alexa functionality is a neat trick, but hardly a major selling point. In fact, given that the Ecobee3’s price has dropped significantly (now $225 on Amazon) since the 4 came out, it’s probably a great time to buy the older unit if you’ve been holding off.